Do you get frustrated about people always talking about your loud snoring and making fun of you for it? If you are snoring like this, you need to take care of yourself and get the proper care that your body needs. 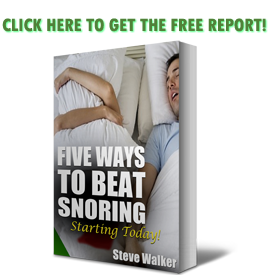 Many people snore because they have sleep apnea and they do not even know it. Sleep apnea is a disorder where your breathing becomes shallow or at some points, will completely stop for a very short period of time during the night when you are sleeping. If you do stop breathing, this is a problem, even if it is just for a very short period of time. The risk for a variety of other health problems is known to be caused by sleep apnea because of the fragmented sleep that a person gets if they have sleep apnea. Close to 18,000,000 Americans currently have some form of sleep apnea. I have been hearing a lot about how sleep apnea can cause cancer, this is statement true? No, if you have sleep apnea it does not mean that you are going to get cancer. It will in no way will cause a person to get any type of cancer. Even though having sleep apnea does not cause cancer, it should be taken very seriously. Some of the types of things that having sleep apnea can lead to include accidents (such as falling down), depression, high blood pressure, and heart disease. If you are a snorer and are very sleepy during the day, you may want to check with your physician to see if you have sleep apnea. If you are overweight and are carrying more pounds on your body than you should, it will increase the risk of you having sleep apnea. Some of the other signs of having sleep apnea include grumpiness, forgetfulness, and headaches that you feel as if you can never shake, no matter what you do. Until you are able to speak with your physician about your possible sleep apnea, you need to not sleep on your back. Research published in the Canadian Medical Association Journal on August 15, 2014 finds that there is no link between obstructive sleep apnea and the development of any type of cancers. There was talk about there being a link between sleep apnea and cancer development or progression of cancer. The research was done with the association between the severity of sleep apnea and cancer. The research looked at over 10,000 people who had sleep apnea who took part in a sleep study between the years of 1994 and 2010. The researchers cross-referenced the information with health databases from the years of 1991 and 2013. At the beginning of the study, 5.1% of patients had been diagnosed with cancer. The patients were there followed for close to 8 years. Close to 7% of the patients who did not have cancer at the beginning of the study developed cancer. The most common types of cancer in the study were prostate, breast, colorectal and lung cancers. After looking over all of this information, the researchers were not able to find a link between sleep apnea and any type of cancer. The study was completed with people with varying degrees of obstructive sleep apnea. The severity of obstructive sleep apnea in a person was not found to be independently associated with any type of cancer. The only exception, of course, was in the group of people that were with the types of cancer that were smoking related. There has been previous research studies completed that said to link sleep apnea to different types of cancer progression. These previous studies that were completed only included only a small number of people along with some biased information. In many of these false studies, the patients were older, had a higher body mass index (BMI) and had more severe sleep apnea than the study done by the Canadian Medical Association. With this in turn, oxygen desaturation would be very common with these patients, which would have most likely have influenced cancer development in these patients. The other studies also had too few patients to provide solid evidence on the outcomes of sleep apnea and cancer being linked to one another. These studies did have a longer follow-up time but the studies were not able to get correct information on the patients' cancer stage and how the management of their cancer was being handled. There were quite a few patients in these studies who had developed cancer. It was not possible for the researchers to completely examine how different types of cancer may even possibly be associated with sleep apnea. In 2013, there was a study that was conducted by researchers from the University of California at Los Angeles. The study found that sleep apnea may increase the risk of different kinds of health problems for women but cancer was not one of these health risks. Researchers could not confirm the findings of the previous studies that linked sleep apnea and cancer but they did find that there was an association between oxygen desaturation and the development of smoking-related cancers. Oxygen desaturation is when there is a decrease of oxygen in a person's blood. Another health hazard that was founded because of this research of not linking sleep apnea and cancer was that people with sleep apnea have a much higher risk of getting pneumonia. There is no need for people to freak out about getting cancer just because you have some type of sleep apnea. There is no link to any type of sleep apnea and cancer. Sleep apnea is a very serious condition and you do need to talk to a physician so you can get your proper sleep that you need but you do not need to worry about getting cancer.